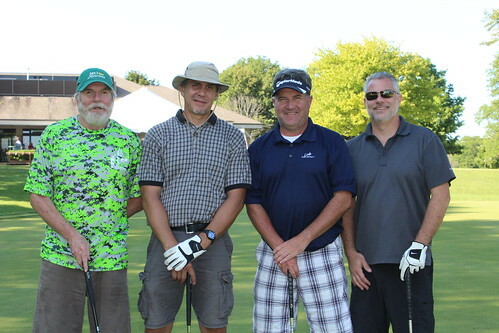 On July 28, SEASPAR hosted its 15th annual Summer Golf Classic fundraiser at the Woodridge Park District’s Village Greens of Woodridge. More than 50 golfers participated in the four-person team scramble tournament. The foursome of Mike Toohey, Neil Buchelt, Cory Abraham, and Tom Canney won the first place prize of $200, which they generously donated back to SEASPAR. Nearly $8,000 was raised to support SEASPAR’s recreational programs and services for individuals with disabilities served by our member entities! Generous sponsors of the event included Ellen Lilly; the Law Office of Gina L. Madden, Attorney at Law; Deirdre Toler; Abbington Distinctive Banquets; Advocate Good Samaritan Hospital; Ancel, Glink, Diamond, Bush, Dicianni & Krafthefer, P.C. ; Avec Panache; Babich & Associates Financial Services; Blooming Color; Bob Carter’s Auto Body; Downers Grove Economic Development Corporation; Downers Grove Park District; Fairview Dental Care; Forzley Eye Clinic; Friends of Ray Osowski; Grove Dental Associates, P.C. ; Lisle Savings Bank; Cathy Mahoney – Downers Grove Park District Commissioner; MG Computer; Midwestern University; the Thomas family; T.W. Group; and the Village of Western Springs. Beautiful raffle baskets and items were donated by 221 Creations, Anderson’s Bookshop, Avec Panache, Chama Gaucha, Downers Grove Park District, Downtown Management Corporation, Home Depot, Jeans and a Cute Top Shop, Lemont Park District, and Dan Skarnulis. SEASPAR is also very grateful for its partnership with the Village Greens of Woodridge and their efforts in making the Summer Golf Classic a success! View event photos on Flickr or browse the gallery below!